The Iceni or Eceni were a Brittonic tribe of eastern Britain during the Iron Age and early Roman era. Their territory included present-day Norfolk and parts of Suffolk and Cambridgeshire. The Iceni were a significant power in eastern Britain during Claudius' conquest of Britain in AD 43, in which they allied with Rome. They remained nominally independent under king Prasutagus until his death around AD 60. Roman encroachment after Prasutagus' death led his wife Boudica to launch a major revolt from 60–61. The Romans finally crushed the rebellion, and the Iceni were increasingly incorporated into the Roman province. The Iceni began producing coins around 10 BC. 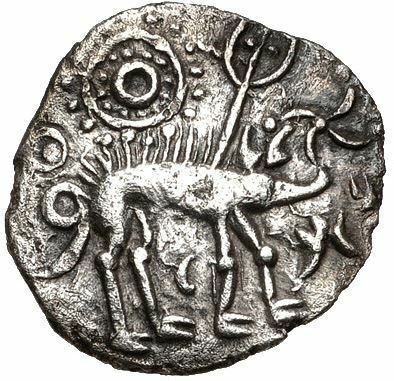 Their coins were a distinctive adaptation of the Gallo-Belgic "face/horse" design, and in some early issues, most numerous near Norwich, the horse was replaced with a boar. Some coins are inscribed ECENI, making them the only coin-producing group to use their tribal name on coins.